Amtrak Guest Rewards is a solid frequent traveler program offering members decent redemption rates, particularly for last-minute bookings and peak travel. Program members can earn points through train travel or with one of Amtrak’s co-branded credit cards. 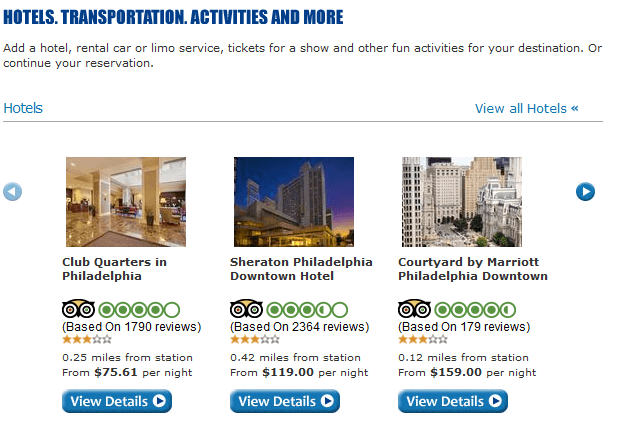 Amtrak also has a few hotel transfer partners, including Hilton HHonors and Starwood Preferred Guest. The quickest way to earn Guest Rewards points is by getting one of the co-branded Amtrak credit cards. Amtrak offers two, the Amtrak Guest Rewards World MasterCard and Platinum MasterCard. Whether you’re a regular commuter or someone who’s planning a dream vacation along one of Amtrak’s iconic routes, you should consider getting the Amtrak Guest Rewards World MasterCard. It has more benefits than the Platinum card, including a bigger sign-up bonus, better bonus earning categories for purchases, elite status qualifying points, a companion ticket a complimentary lounge pass. The companion ticket alone will pay for its $79 annual fee.You cannot use your Amtrak Guest Rewards points toward air travel since Amtrak has no airline partners. 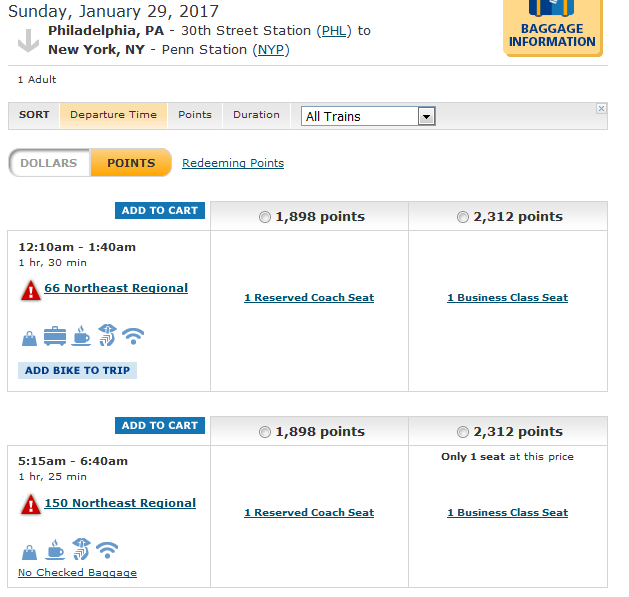 When Should You Use Amtrak Guest Awards? The Amtrak Guest Rewards program is revenue-based, so the number of points you’ll earn is based on the cost of the fare, not the distance you’ve traveled. Award redemption pricing is a little more complicated, though. 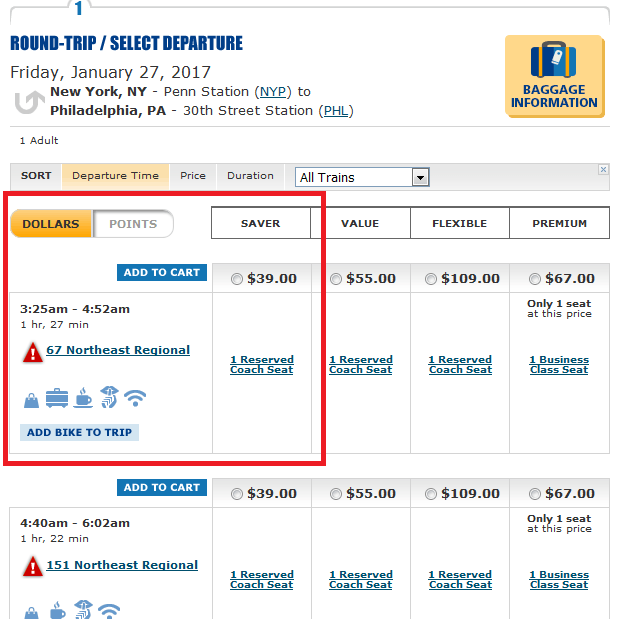 Amtrak has four fare levels for cash purchases: Saver, Value, Flexible and Premium. However, all economy award ticket prices are based on the cost of the Value fare. That means you’ll get more value for your points if you use them for itineraries that don’t have Saver level fares available, including close-in bookings and peak travel. If you redeem for an award ticket when a Saver cash fare is available, you’ll get a value of 2.22 cents per point. However, if you get an award ticket on a train that only has Value cash fares and higher available, you get 2.89 cents per point. Those values are fixed for all economy tickets on Amtrak. 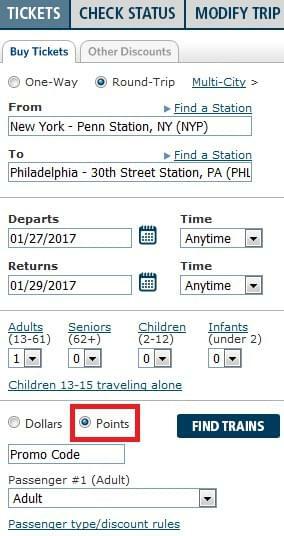 Since Amtrak’s online booking system is easy to use and allows you to book any type of award, you shouldn’t need to call. 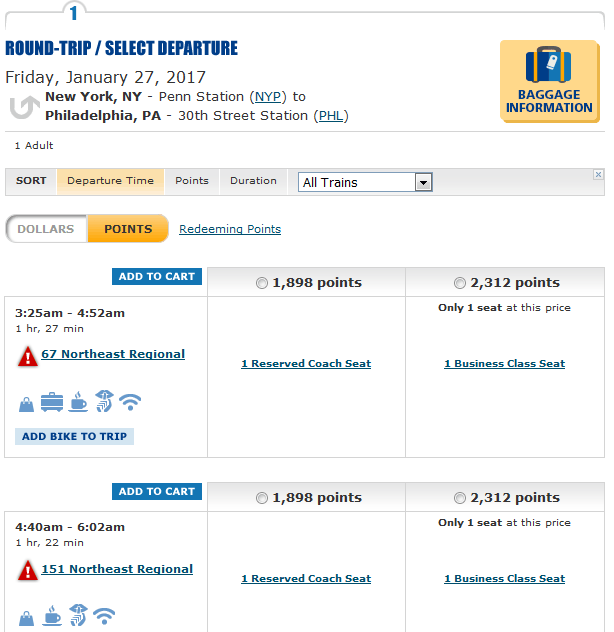 Click on Redeem Points for Amtrak Travel from the drop down menu. Fill in your travel information on the next page. Be sure to select Points instead of Dollars. Click Find Trains. The next screen will give you the available outgoing trains. Note that you can toggle between Dollars and Points at the top, making it easy to check if there’s a saver cash fare available on the train you want. Select the fare you want and click Add to Cart. If you haven’t done so already, you’ll be prompted to complete the Amtrak Rewards login. Choose your return train on the next screen and click Add to Cart. Next you’ll be asked if you want to add any Travel Extras to your itinerary. Those include hotels and other activities available at your destination. If you do not want to add anything to your trip, click on Enter Passenger Information in the lower left corner of the screen. After completing your personal information, you’ll be asked to confirm your itinerary and complete payment. If you prefer to book by phone, or if you have any questions or issues, you can call the Amtrak Guest Rewards Service Center at 1-800-307-5000. Amtrak also has a 24-hour phone ticketing center available at 1-800-872-7245. Be sure to dial 0 or say “agent” to bypass the automated system. Agents are on duty from 5 am to midnight Eastern Standard Time.